The postman was really early riser. He didn't even know I was waiting for him to shave !! Happy as a child on Christmas day, I discarded the package. Two beautiful leather pouches (ecological? ), hold each of the different configurations in a secure manner. Fate immediately offers me the desired one: the sweet (mild). Already at the sight, but more to the touch. Definitely after the first use. The spark was triggered on the first date. I still don't know if it will be the great Love, or a spectacular crush. But it certainly didn't leave me indifferent. Aren’t twins wonderful! 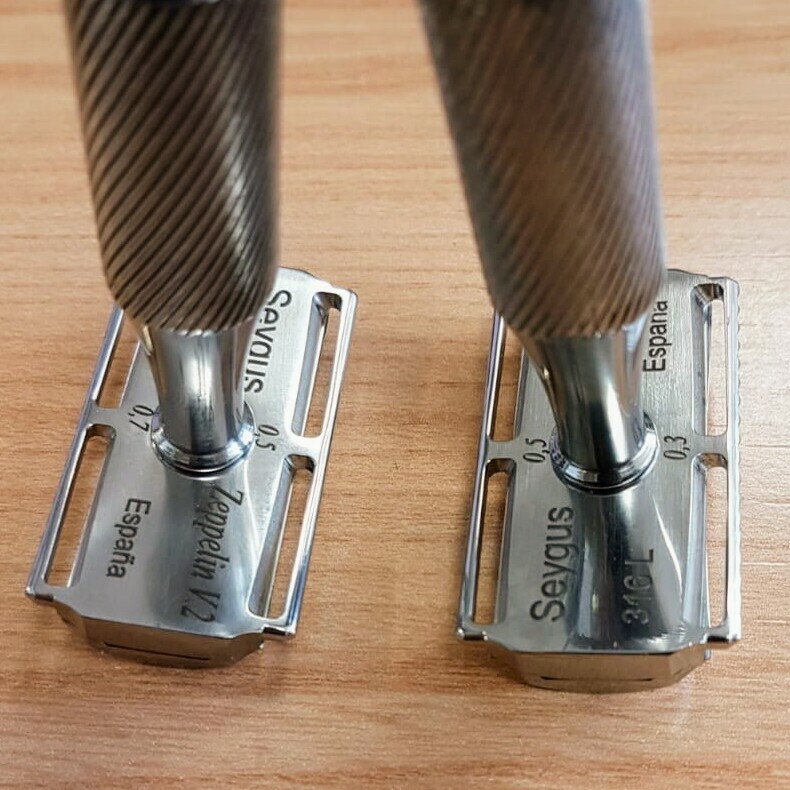 Very nice looking razors! i purchased the V2 with the .5 and .7. Interesting to hear your comments on the .3 and .5. (03-27-2019, 03:32 AM)Ols67 Wrote: Aren’t twins wonderful! Despite they're not twins (but cousins), each one is a beauty. Is the head curved or my eyes are failing me? How that helps on shaving? I don't know how to describe it well. I also don't want to offend the maker by mistake. 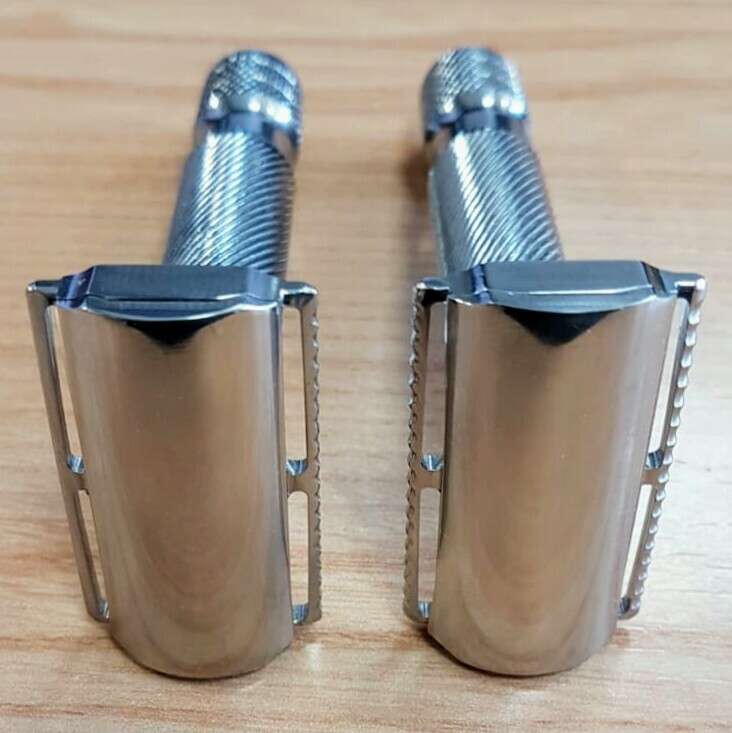 The razor looks a lot like a prototype or like an amateur work, especially the handle with the imperfections. Nevertheless, it is an interesting design. Unique for sure. edit: That razor case is amazing! (03-27-2019, 01:44 PM)nikos.a Wrote: Is the head curved or my eyes are failing me? How that helps on shaving? That helps the rigidity, to hold better the blade. In fact comfort is outstanding. But geometry is very effective too. This new design is a hybrid. It combines the strong hold of modern models with the curvature of some specific ones of the past. There's nothing similar out there. BTW, even if I prefer a longer handle, I find this nice. It's a unique piece of hardware. Enjoy! (03-28-2019, 03:29 AM)nikos.a Wrote: It's a unique piece of hardware. There're topics on other forums about this new geometry. Specially about the difference between a slant and this curved edge. IMHO, Seygus Zeppelin V2 is not a slant. But for sure it's not a classic straight edge DE razor. I feel it not in the middle, but above each. More effective than a normal one. I'll need an Above The Tie Calypso S1 to compare. BTW, It's quite more efficient than ATT Kronos M1 / R1 stainless steel. "-Central curve for a slantlike effect." I feel them the same. Good depth, very easy, great comfort. A pleasant and fast BBS in three passes, with a normal Astra Green. So much so that you do not feel regrowth, or other discomforts, for the whole day. For me, considering the (poor) quality of my skin, an excellent result. Tomorrow I want to try with a longer handle. If the balance doesn't change too much, maybe the aluminum Maggard MR14. Otherwise the Windrose Z1 "Darwin" ... or the ATT Kronos. For now I have no doubt about the new geometry of the Zeppelin V2 head by Seygus. For my taste only the handle, although I like it aesthetically, I do not find it comfortable from the ergonomic point of view. Unfortunately there are no other models, and it is also more expensive than others. So the choice would be only the head group. Slantlike ... slant-ish ... curved ... not straight. Today I used the Maggard MR14 handle. Thus is born the chimera (or frankenrazor) Zeppelin14. It has the advantage of length (100mm) and weight (68g). The almost halved mass, I paid with a balance moved further forward (head 41g / handle 27g). But thanks to ergonomics and lightness, I found the result very pleasant. Even today, three passes, all 05. Usual effectiveness, usually comfort, but with greater speed and safety. A magnificent shave, completely carefree. For me, this Zeppelin V2 just the head. Just see if the standard Seygus 05+07 will displace the sweet (mild) cousin in my heart. Enjoy the razor; it shaves great and has a dime of beauty. Regarding design, curve just adds some stress on the blade. Keeping it stiff mainly in the centre, where they use lose it. Cap wings add some glide to the head as they are very thin. This is a quite simple design with just a couple of happy novelties. That add some value to the final gadget. With today I finish the test with the sweet (mild) head 03+05. The chimera Zeppelin14, all side 03, behaved very well. A little less deep than the original Seygus Zeppelin V2, the frankenrazor (or franken razor? ) thanks to the Maggard MR14 handle is even more comfortable. Using both sides, or going directly against the grain with advanced movements, is an instrument of absolute effectiveness. With a modification of the usual three passes (ATG / XTGR / retouch), using the J-Hooking in the two passes and Blade Buffing in touch-ups, the result is more incisive. But with the same incredible level of comfort !! Thanks to a member of the Dutch shaving forum I've shaved with the V1 .3/.5mm and two V2's, a .7/.7 and a .9/.9mm. The V1 is a bit too mild for my liking, although it shaves absoluty with no irritation whatsoever. Of the other two, I liked the .7/.7 best. Great combination of effeiciency and comfort. The .9/.9 was a bit too much for me. The slight frown the design gives the blade does not hamper the shave, it just means adjusting the shaving angle a bit for the best effect. 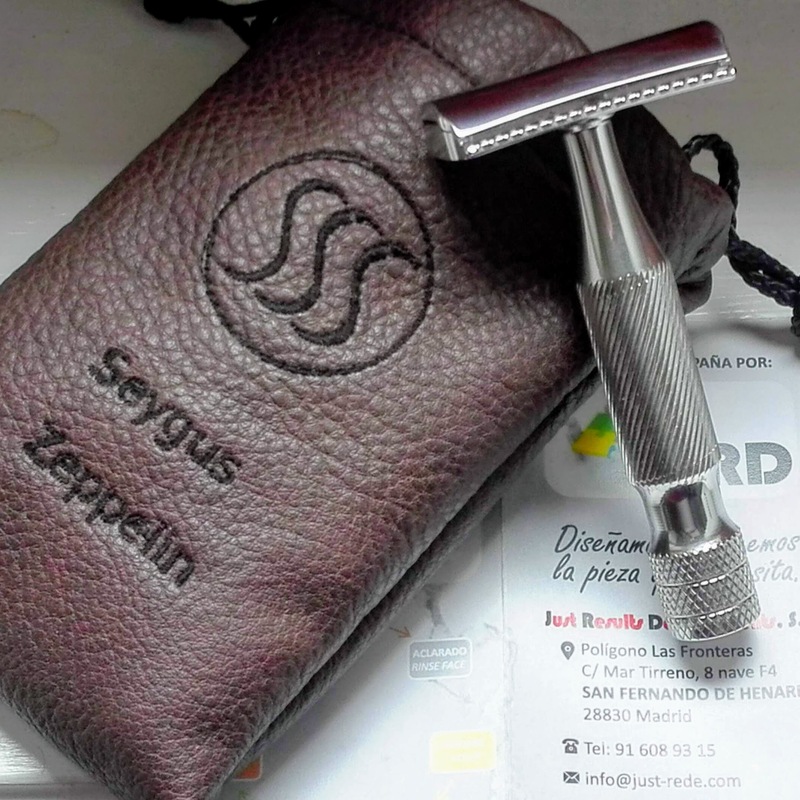 Today another version of the frankenrazor with Seygus Zeppelin V2 head, the KronosATZ0305. Even more convinced: for me, just the head. A longer handle is highly beneficial !! For those who do not want to change the razor too much, something like Above The Tie Kronos is prefect. This chimera is more faithful to the original. Every sensation is very close. However, the longer handle offers undoubted advantages. In addition to having cut my finger while cleaning, mounting the topcap with the more arched side (topcap) on the 07 side (plate) was really aggressive. I am especially interested in the details of the Standard topcap (05+07). I cut my finger with the topcap. NOT with the blade. There was no blade. I was cleaning it, not changing the blade. I do not know other users experience. As I've not purchased, for now I've not customer support. So I'm asking to other users, IF it's just one razor (quality control) ... or Standard 05+07 topcap has corners / symmetry (design) issue too. This is one I'd like to try.